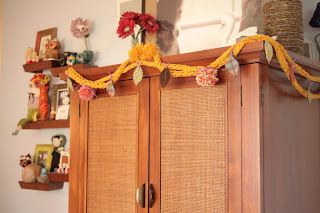 A couple of you have asked for tutorials on the finger garland and the poms, so I thought I'd lead you to some links. First of all, when you start making poms, you won't stop. They are so fun and they brighten everything. Here's a great tutoria.l These things were ALL OVER the last craft fair I went to. I added them to my fall wreath to make it more fun. Here's great tutorial for the finger garland. This is a lot of fun to do, also... especially if you have a little one around to help. :) After I finished my garland, I just cut some leaves out of various fabrics and zigzag stitched them to some felt to keep them flat. Then I cut up a few more poms to give it a little weight and nice texture. I used the finger weaving last year to make a really pretty garland for my Christmas tree. I plan to do it again this year, but in a different color. thanks for the tutorial links! 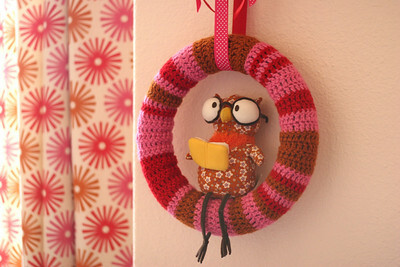 i actually have the little owl sitting on the crocheted wreath! he's so merry. I have to say, I'm very excited to see your cute things at Renegade. I'm finally going to make it there this year! :) Good luck!